Fünfzehnern, also known in English as Fifteens, is a trick-taking game for three or four players. Unlike most other trick-taking games, Fünfzehnern doesn’t allow you to lead just any old card. Instead, you have to keep leading cards of the suit you first won the lead with, as long as you have them! Fünfzehnern is an old German game. Descriptions of it date back to at least the late 1800s. The object of Fünfzehnern is to take in tricks as many cards ranked 10 and above as possible. 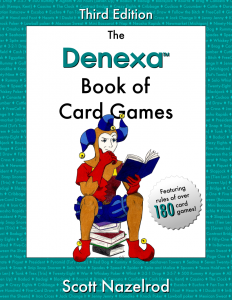 The ultimate goal of this is to achieve a hand score of fifteen points or better. Fünfzehnern is played with the same pack used to play Piquet. 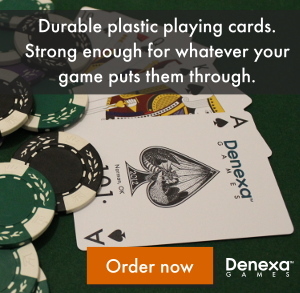 To make such a pack from a set of Denexa 100% Plastic Playing Cards, remove all the 6s through 2s. You’ll be left with a deck of cards with aces through 7s in each of the four suits, for 32 cards in all. If playing with three players, remove one of the four suits entirely, giving you a 24-card deck. You also need something to keep score with. Pencil and paper works fine, but Fünfzehnern is traditionally managed with a “hard-score” method (chips or counters are paid into and taken from a central pool). Shuffle and deal eight cards to each player, using the entire deck. The player to the dealer’s left leads to the first trick. All other players must play a card of the same suit, if possible. Otherwise, they may play any card. Once everyone’s played, the person who played the highest card of the suit led wins the trick. That person takes the cards that made up the trick and stacks them into a face-down won-tricks pile. That player then leads to the second trick. When a player takes the right to lead from another player, they must continue to lead with cards of the suit they won the lead in. Only when they run out of cards of that suit can they change to a different suit. The only exception is if they have a card of a different suit which they know is unbeatable (i.e. because it is an ace, or because all the cards of that suit that would outrank it have been played). For example, Riley leads hearts, and Marty wins the trick. Marty may now only play hearts as long as he has them. He holds the A♠, though, so he can also lead this, as he knows it is unbeatable. As soon as he runs out of hearts, he can lead to whatever suit he pleases. At this point, if Riley manages to beat Marty on a trick that he led diamonds to, Riley must continue to lead diamonds until he runs out of them. Holding both a king and queen of the same suit is called a force, or zwang. If the ace of that suit has yet to be played, the player may lead the queen and declare “zwang“. The player holding the ace of that suit is then compelled to play it on that trick. This, of course, wins the trick, but the forcing player now knows the king they hold is the highest unplayed card of that suit. 9s, 8s, and 7s have no point value. Game play continues until a predetermined time or number of hands.